UPDATE: FloatableWindow is now on CodePlex for easier community contributions and management of latest source and builds. FloatableWindow CodePlex Project. If you like this idea VOTE FOR IT in the Silverlight Toolkit! This is great for those true modal needs. It responds to normal windows DialogResult type responses if you have buttons, etc. – great for error dialogs, logins, etc. The request I’ve been seeing is for the same functionality, but in a ‘normal’ ChildWindow. But I’ve been seeing requests that it should act more like the normal Window object in .NET, which has an option for showing a window as a ‘dialog’ (modal) versus a normal one. Well, since the source code is available under Ms-PL license at the Silverlight Toolkit project, I decided to play around and refactor a bit. If you look at the base class implementation of Window, the API shows two methods: Show and ShowDialog. This is what I wanted to emulate. I changed the ChildWindow to FloatableWindow only because I couldn’t think of a better name and it represented a desired behavior. 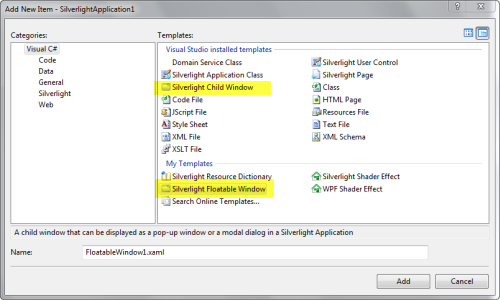 In ChildWindow, the default behavior is a modal dialog and there are a few key areas that drive this behavior. There is a template part called Overlay that is responsible for the faded-out background of your app when the ChildWindow is shown. The other modal semantics are driven by looking at the RootLayout of the parent creating the ChildWindow and changing its properties (IsEnabled=False). Basically I just spelunked these areas and did some changing. But it was an experiment at least and seems to work so far. Here’s the code: FloatableWindow_1.1.zip. The archive file includes the code I used as well as Visual Studio item templates (C# and Visual Basic) to mirror the same functionality of Add New Item where you can add a new ChildWindow to your project as a user control. Let me know what you think. Hope this helps!